We can come to a location of your choice in Warrington or surrounding areas to repair your car scratches, scuffs, chips & paint defects at a time that suits you. In the past all car body repairs and minor accident damage to vehicles were sent to a traditional bodyshop and could be there for a weeks on end, therefore leaving you without your vehicle. That sort of inconvenience is a thing of the past, with our fully equipped vans we repair vehicle paintwork scratches, scuffs, scrapes and dents on site, all whithin the same day. DJ Smart Repairs mobile car bodywork repairers are fully trained and have all the necessary tools and equipment to deal with your car scratch, dent repairs and mobile alloy wheel repairs in Warrington and surrounding areas, and work to the highest car bodyshop standards. Scratches are removed on site by using SMART repair techniques, keeping the repair as local to the damage as possible, your vehicle is then machine polished to an undetectable factory finish. We have much lower overheads than traditional bodyshops and we only repair the damaged area of a panel meaning you get the same high quality finish at a much lower cost. Any alloy wheel scratches, chips, kerb damage and corrosion can be repaired and refinished through our Warrington mobile alloy wheel refurbishment service at your home or workplace. DJ Smart Repairs Warrington Mobile Alloy Wheel Repair Technicians can also repair cracked alloy wheels but the wheel must be taken to one of our workshops to be welded, therefore cannot be finished the same day. We guarantee a quick turnaround and a quality finish at the same low cost. DJ Smart Repairs Warrington can meet all your alloy wheel needs, whatever damage your alloys have taken. Whether they have suffered from curb damage, have been scuffed or simply marked we can repair them for much less than what a new set of wheels would cost. We can also do a full re-polish or full re-paint on faded or scratched alloys. Split rim wheels or multi-spoke wheels are no problem either. So whatever the marque we can fix your alloy wheels, from Audi to VW, BMW, Mercedes and Porche. We even specialise in split rim and multi spoke alloy wheel repair. Please ensure that your alloy wheels are cleaned prior to our arrival and you have the locking wheel nuts for your alloys. No tyre shine should be used 1 week prior to the repair as this may affect the painted surface! Firstly, we assess the wheel for trueness and any safety issues before removing all the damage using special sanding techniques and fillers. The wheel is then primed and heat treated. Two coats of base coat is applied and then heat treated again. Finally two coats of 2k high gloss lacquer are applied to ensure a hard-wearing durable finish and a deep shine followed by another heat treatment. A typical refurbishment for a full set of alloys will take one of our experienced technicians approximately 3-4 hours to complete a perfect job. Please note: we do not repair buckled wheels only cracked alloys. Why should you use us to repair and restore your alloy wheels to new? We’re local to the Warrington area. All our repairs come with a 2 year guarantee/warranty. All repairs are carried out at a location of your choice where we will provide a mobile “on-site” repair. We are absolutely determined to provide the best possible S.M.A.R.T repair service in Warrington. For a fast and competitive quote please use your mobile phone to take a photo of the damage sustained to your vehicle. Then simply upload this using the online quote form. Alternatively you can give us a call on 07999 909 404 to speak with us direct, we're always happy to advise and listen to your requirements. 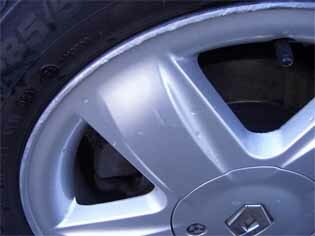 Our mobile alloy wheel repair services are available throughout Warrington and surrounding areas. DJ Smart Repair Warrington's mobile car body repairers are fully trained and have all the necessary professional tools and equipment to deal with your car scratch repairs and dent repairs in Warrington and surrounding areas, and work to the highest car bodyshop standards. We can come to your home address or a location of your choice in Warrington or the North West to repair your car scratches, scuffs, chips & paint defects at a time that suits you. In the past all cosmetic repairs and minor accident damage to vehicles were sent to a traditional bodyshop and could be there for a week or more, leaving you without your vehicle. That sort of inconvenience is a thing of the past, with our fully equipped vans we repair auto paintwork scratches, scuffs, scrapes and dents on site the same day.